We love to collaborate to empower educators. The TELL Project has been asked to partner with numerous national and state entities to greater influence growth in teacher effectiveness. We place high value on these partnerships and the opportunities they provide to enhance world language teacher growth. Some examples of these partnerships are listed below. If your organization would like to collaborate with the TELL Project to enhance your own mission, please contact us so that we may enter into discussions with you. In Delaware, the World Language Immersion Education Specialist at the Delaware Department of Education, Lynn Fulton-Archer, is leading her team of field agents and immersion teachers through a carefully crafted professional growth framework based on the TELL framework and its tools to support teachers and personalize their professional growth. At the National Foreign Language Center, STARTALK has developed a series of STELLA (STARTALK + TELL) modules that offer guidance through practical activities which illustrate both the STARTALK principles and the practices identified by TELL as representing model teachers. The activities were designed with teacher participants at three different experience levels in mind: beginning teachers, emerging teachers and advancing teachers. In Virginia, teachers are demonstrating growth by building professional portfolios around the newly designed Virginia Foreign Languages Professional Development Framework, which attempts to respond to a need to provide sustained, renewable, and relevant professional development activities. 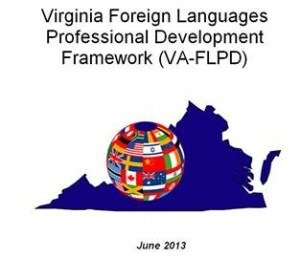 The VA-FLPD framework is divided into strands that mirror the Teacher Effectiveness for Language Learning Framework and identifies many of the TELL tools in its implementation. State level world organizations such as the Illinois Council on the Teaching of Foreign Languages, Kentucky World Language Association, South Carolina Foreign Language Teachers Association, and Texas Foreign Language Association have organized their annual conferences around the TELL domains. Teachers self-assess their own performance prior to attending and set goals for their professional learning time at the conference. Conference sessions are organized according to the TELL domains and criteria so teachers can easily select sessions to meet their individual, pre-determined needs. These collaborative approaches enhance the probability of more powerful and more individualized learning experiences for teachers.